Chu chee is traditional curry sauce for seafood, such as prawns and scallops. Here we have combined it with salmon because the strong flavour, colour and texture of the fish goes particularly well with this rich red curry sauce. First make the Chu Chee sauce. Gently heat the coconut cream in a medium saucepan and add the curry pastes. Cook, stirring, for about 5 minutes, until the curry paste oil separates and rises to the surface. Add the coconut milk, fish sauce and palm sugar and simmer for 7 minutes, stirring often. Set aside and keep warm. Heat the oil in a frying pan and fry the salmon until golden brown. Remove the salmon and add to the warm Chu Chee sauce, shaking gently to coat the salmon. 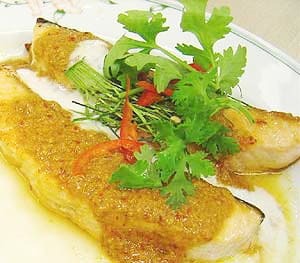 Tranfer the salmon and sauce to a serving dish and garnish with basil leaves, kaffir lime leaves and sliced chilli.